Kelly talked about Native elders being an important part of American Indian communities. Indeed, elders are revered and respected throughout Native cultures. The communities show this respect in many ways… listening, seeking their wisdom, serving them first at meals, looking to them for prayers, honoring them as Veterans, making them a central part of family and community gatherings, and generally taking good care of them. Acoma Pueblo, Blackfeet Nation, Cheyenne River, Crow Agency, Fallon Paiute Shoshone, Flathead Nation, Fort Belknap, Fort Berthold, Fort Hall, Fort Peck, Havasupai, Hopi, Jemez Pueblo, Lake Traverse, Mescalero Apache, Navajo, Northern Cheyenne, Omaha, Pine Ridge, Quechan, Rocky Boy, Rosebud, San Felipe Pueblo, San Ildefonso Pueblo, San Juan Pueblo, Santa Clara Pueblo, Santee Sioux, Santo Domingo Pueblo, Spirit Lake, Standing Rock, Taos Pueblo, Tohono O’odham, Trenton ISA, Ute Mountain, White Mountain Apache, Wind River, Winnebago, Wyandotte Nation, Yankton Sioux, and Zuni Pueblo. Most commonly, tribal professionals and volunteers operate nutrition sites within the seniors centers to prepare and serve hot meals for the elders during the week. If elders are unable to come to the center, a hot meal is home-delivered even if they are 40 or more miles away. In the communities we serve, this is often the elders’ only healthy meal for the day. Last year National Relief Charities supplied senior centers with staple foods for 65,000 people. 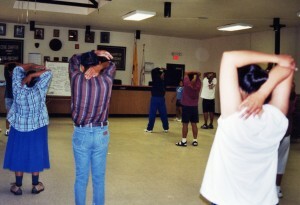 Reservation senior centers are also important for spiritual and psychological well being. 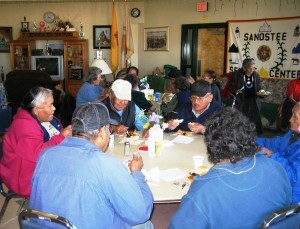 Participation at the centers are often the elders’ only social interaction for the day. Earlier this year, Kelly posted about remote communities and isolation. The senior centers give these older Americans a place to be and a sense of community. Senior center vans transport isolated elders to the senior centers, and our senior center partners work tirelessly to create activities that are responsive and inclusive of the elders in their communities. These activities reflect the elders’ skills, interests, and diverse needs, and they empower and encourage dignity, independence, and involvement in the senior center and the community. When senior centers become the focal point for all things elder-related, they serve the entire community. As such, they are the community resource for information on aging, caregiver support, transportation issues, connections to other community programs, and training for families and professionals involved with elders. The endless efforts of reservation senior centers make it clear to Native elders that they are an important part of the tribe and community and that they are valued and remembered. This entry was posted in Humanitarian, Programs and tagged American Indian elders, nutrition, Older Americans, senior centers, senior olympics. Bookmark the permalink. Post a comment or leave a trackback: Trackback URL. It can be difficult to write about this topic. I feel you did an superb job though! Thanks for this!